In recent years, China has become embroiled in a series of disputes over rights to islands and seabeds in the South China and East China seas. The areas are rich in oil, gas, fishing and mineral resources. But the conflicts are also driven by hard feelings over the past, particularly Japan’s decades of imperial conquest, and by fears over the future, as the region adjusts to China’s rise to superpower status. In the summer and fall of 2012, tensions ran highest between China and Japan over a group of uninhabited islands in the East Asian Sea that both countries claim. The islands are known as the Diaoyu in China and the Senkaku in Japan. The trouble began on Aug. 15, when Japanese authorities arrested 14 Chinese citizens from a Hong Kong-based vessel after some of them staged a protest by landing on one of the islands. The landing of Japanese activists on one of the disputed islands further intensified tensions. In response, anti-Japanese protests, some violent, spread across China, apparently chaperoned and approved by the police. The governor of Tokyo, a well-known nationalist, further angered Chinese activists by announcing that he wanted to buy three of the disputed islands from their owner, a Japanese citizen. He said he believed that Japan’s central government was not doing enough to defend them. The next week, the Japanese government announced that it had bought all of the islands from their private Japanese owners for nearly $30 million. It said it acted in the hope of forestalling further conflict, but China accused Tokyo of stealing the islands and dispatched two maritime enforcement ships in a show of force. 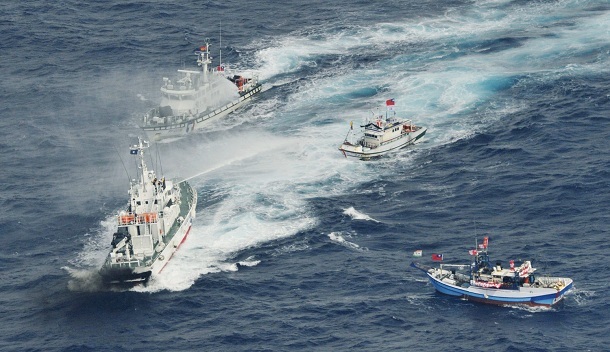 In late September, the Japanese Coast Guard used water cannons to disperse fishing boats from Taiwan near the islands, which are also claimed by Taipei. In October, China announced that it would not send its finance minister or central bank chief to the annual meetings of the International Monetary Fund and the World Bank in Tokyo. The decision was a clear sign of China’s displeasure with Japan’s handling of the dispute over the islands. The last-minute cancellation, confirmed by Japanese officials on Oct. 10, came as a Japanese news agency reported that Tokyo may try to defuse the standoff by officially acknowledging for the first time that China also claims the islands. On Oct. 11, a senior Chinese diplomat made a secret visit to Tokyo to hold talks aimed at defusing tensions between the two countries, according to a Japanese government spokesman. The spokesman, Osamu Fujimura, said Luo Zhaohui, who leads the Chinese Foreign Ministry’s Asian Affairs Department, met with Shinsuke Sugiyama, the director general of the Asian and Oceanic Affairs Bureau at Japan’s Foreign Ministry. According to a statement from the Japanese ministry, the diplomats “exchanged opinions” on the dispute and held preparatory talks for a higher-level meeting between the two nations to take place at an unspecified date. After allowing anti-Japanese demonstrations that threatened to spin out of control, China in late September reined them in andturned instead to hard-edged diplomacy over the disputed islands in the East Asian Sea to lessen to lessen any potential damage the conflict might have inflicted on the nation’s softening economy and a delicate leadership transition. With relations between the two Asian powers at a low point, China decided to go ahead with a scaled-back reception in Beijing on Sept. 27 to honor the 40th anniversary of the resumption of their diplomatic ties on Sept. 29, 1972. But Beijing sent a not-so-subtle message to Tokyo by not granting clearance to the plane that would have brought in an important Japanese guest, the chairman of Toyota. Other Japanese attended the event, though, and at the United Nations in New York, the two sides met in private and sparred in public. The same day, around the disputed islands, a large flotilla of Chinese patrol boats was being monitored by about half of Japan’s fleet of coast guard cutters, the Japanese newspaper Asahi Shimbun reported. Protests in more than 80 Chinese cities, including in urban centers where Japanese car dealerships and electronics plants were damaged, suggested that the Chinese leadership approved the outpouring of nationalism in part as insulation against criticism of the party itself during the transition of power that is scheduled to take place at the 18th Communist Party Congress, set to begin on Nov. 8. But the protests threatened to turn against the Chinese government itself, diplomats and analysts said. Even though China has overtaken Japan as the biggest economy in Asia, Beijing’s handling of the dispute highlighted the interdependence of the Chinese and Japanese economies, and the limitations on what the leadership could allow. So many Chinese workers are employed at Japanese-owned companies, analysts said, that any escalation of tensions leading to a boycott of Japanese goods could lead to huge job losses. At a time when overall foreign investment in China is shrinking, Japan’s investment in China rose by 16 percent in 2011. The Japan External Trade Organization reported $12.6 billion of Japanese investment in China in 2011, compared with $14.7 billion in the United States. Exactly how the anti-Japanese protests were organized, and by whom, remained murky. A rough chronology showed that immediately after the Japanese government announced it had bought the islands, protests began in Beijing and other cities. The protests then spread, reaching a peak on the anniversary of the Sept. 18, 1931, Mukden Incident, which led to the Japanese invasion of Manchuria. After that, the protests were shut down. It appeared that permission for the weeklong protests had been discussed at very high levels, said one foreign diplomat who had followed the events closely. Japanese automakers suffered plunging sales in China in Septemberand have cut manufacturing by up to half in China in October after the violent anti-Japanese protests in which Japanese-brand cars and even their owners were targeted. Toyota announced on Oct. 9 that its sales to dealerships in China dropped 49 percent in September from the same month a year previously, while Honda said that its sales had fallen 40 percent and Nissan said that sales were down 35 percent. Mazda said in early October that its sales had fallen 35 percent in September. When a 51-year-old man in Xi’an made the innocent mistake on Sept. 15 of driving with his family in a Toyota Corolla past an anti-Japanese demonstration, he was so severely beaten that he remains partially paralyzed from brain injuries, while the car was destroyed. The law enforcement authorities in another province detained in early October the main suspect in the beating, according to a spokesman for the Xi’an police. The South China Sea is bounded by some of the world’s fastest growing economies, including China, Taiwan, the Philippines, Malaysia and Vietnam. It is rich in oil, gas, fishing and mineral resources, and has become an arena for the geopolitical tensions that have accompanied China’s rise to world power status. The conflicts between China and other nations over rights to islands and seabeds has created anxieties that the United States has sought to underscore to emphasize its potential role as a counterweight to Beijing. The sea goes by different names among the competing countries — it is South Sea to the Chinese and East Sea to the Vietnamese, while South China Sea is a Western designation. In 2012, territorial disputes in the area increased between the Philippines and China, and between Vietnam and China. Taiwan, Malaysia and Brunei also have conflicting claims in the South China Sea, making the area a source of a potential military showdown. China and Southeast Asian nations have plied the disputed waters with boats to reinforce claims to the territory. Foreign analysts say that fishing vessels often coordinate with other ships and naval vessels to present a united front. Conflicts abound. One dispute, which lasted for months, involved a standoff between lightly armed vessels belonging to China and to the Philippines at the Scarborough Shoal off the coast of the Philippines. Another dispute centered on a law enacted in Vietnam claiming sovereignty over the Paracel and Spratly Islands, which China also claims. In September, the territorial tensions were a central focus of meetings between Secretary of State Hillary Rodham Clinton and top Chinese leaders. Mrs. Clinton has repeatedly called on China to discuss with the Association of Southeast Asian Nations a code of conduct to address disputes in the region. The Chinese have firmly resisted that idea, insisting on direct negotiations with individual countries. The State Department has said that China would be more likely to get its way by bargaining with individual nations than with the entire regional bloc. In July 2012, the International Crisis Group, a research organization that has become a leading authority on the frictions, released a report, stating that the disputes between China and four of its Southeast Asian neighbors over claims in the South China Sea have become so intense, the prospect of open conflict has become more likely. The pessimistic conclusion came a day after China stepped up its political and military control of the Paracel and Spratly Islands, which both Vietnam and the Philippines claim, and the Macclesfield Bank, claimed by the Philippines. The islands are known in Chinese as Xisha, Nansha and Zhongsha. The analysis by the International Crisis Group apportions blame to both China and its neighbors for ratcheting up incidents and tensions in the sea which, in addition to being one of the most traveled bodies of water in the world, is also a vital strategic pathway for the United States and its allies. China’s assertive approach has been matched by Vietnam and the Philippines, which are forcefully defending their claims and enlisting outside allies, the report said. In July 2012, the Philippine president, Benigno S. Aquino III, announced plans to buy aircraft, including attack helicopters that could be used in territorial disputes in the sea. During summer 2012, China steadily increased its pressure, sending patrols with bigger ships and issuing persistent warnings in government-controlled newspapers for Washington to stop supporting its Asian friends against China. The leadership in Beijing appears to have fastened on to the South China Sea as a way of showing its domestic audience that China is now a regional power, able to get its way in an area it has long considered rightfully its own. Some analysts view the stepped-up actions as a diversion from the coming once-a-decade leadership transition, letting the government show strength at a potentially vulnerable moment. Washington was reacting to what it saw as a continuing campaign on the South China Sea after Beijing prevented the Association of Southeast Asian Nations, at its summit meeting in Cambodia in July, from releasing a communiqué outlining a common approach to the South China Sea. The dispute keeps escalating. On July 31, the 85th anniversary of the founding of the People’s Liberation Army, the Chinese Defense Ministry heralded the occasion by announcing “a regular combat-readiness patrol system” for the waters in the sea under China’s jurisdiction. The government then said it had launched its newest patrol vessel: a 5,400-ton ship. It was specifically designed to maintain “marine sovereignty,” said People’s Daily, the Communist Party’s leading newspaper. Specifically, China lays claim to everything within what is called anine-dash map. The map, which appears in government documents and even in Air China’s in-flight magazine, is one of the central points of conflict in the South China Sea dispute. The map features a U-shaped line south of China that passes close to Vietnam, then around Malaysia and north to the Philippines. It was drawn by China before the Communist takeover but is not recognized by any other country. A joint amphibious landing on a remote island was canceled to avoid angering China. Analysts say the 14th straight day of patrols in the East China Sea suggests China is trying to wear down Japan’s resolve. Chen Jian, a former United Nations under secretary general, complained that Japan was being encouraged to take on security concerns, empowering the right wing in that country. The cut, prompted by a slump in sales amid often violent protests in a dispute about the ownership of islands in the East China Sea, made it appear likely that Nissan and Toyota will follow suit. The Yaris, intended to be the car model that propelled Toyota to sales of more than one million cars in China, missed the mark with the country’s higher-end customers as well as its middle class. A trek through the remote Mustang region reveals towering peaks, enduring tales and transcendent faith. For the first time in three weeks, Chinese ships entered waters near a group of disputed islands in the East China Sea early Thursday. Japan’s exports tumbled 10.3 percent in the year to September, their sharpest decline since the aftermath of the 2011 earthquake and tsunami, and the Bank of Japan cut its outlook for regional economies. A delegation of Americans who held top security positions will try to defuse a growing dispute over territory disputed by the two Asian nations. Shinzo Abe’s action raises fresh concerns about whether as a national leader he would push a right-wing agenda that would further damage Japan’s ties with Asian neighbors when they are already strained by island disputes.